New York — Book publisher 21st Editions announces the premiere of Deep Roots, a unique art object that represents the collaborative spirit in which 21st Editions has been based for twenty years. Deep Roots is a grand and monumental creation that pays homage to one of the earliest photographic processes, wet plate collodion, and will premiere at the Photography Show presented by the Association of International Photography Art Dealers. The images featured in Deep Roots are the work of photographer Timothy Duffy, an artist who has resurrected the tintype to create modern and profoundly relevant work with this archaic process. Born from the raw and honest partnership of photographer Timothy Duffy and luthier and sculptor Freeman Vines, Deep Roots is a modular exhibition that features a set of 25 tintypes that capture the hauntingly visceral “guitars” that Vines constructs with mostly hand tools from found wood from age-old trees of the South. The tintypes measure a colossal 20 by 12 inches. Each plate is coated, exposed, and developed within ten minutes. The seamless adaptation to the process by Duffy transcends the boundaries of his humanity to allow something spiritual and out-of-mind allowing him to transform the rawness of his subjects onto tin. The set of 25 is housed in five meticulously designed and handmade boxes by artisan Peter Geraty that incorporate veneers made from the remnants of the age-old wood of Vines’ guitars. 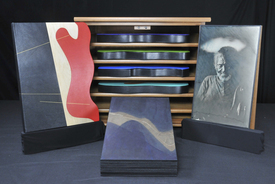 The five boxes are accompanied with text written by folklorist Zoe Van Buren and are bound with multicolor goatskin inlays, all of which are presented in a custom-made, African wood cabinet by John Patriquin.